Seen above at a career fair (come work for us! ), Owly has lots to reflect on as HootSuite recently launched three new tools in the App Directory, opened its Engagement API, added an external integration with click.to, introduced a new Solution Partner Program, and released an infographic on Super Bowl XLVI. See the reactions to and reception of these new announcements in today’s News Roundup. The firehose of media coverage doesn’t stop there. 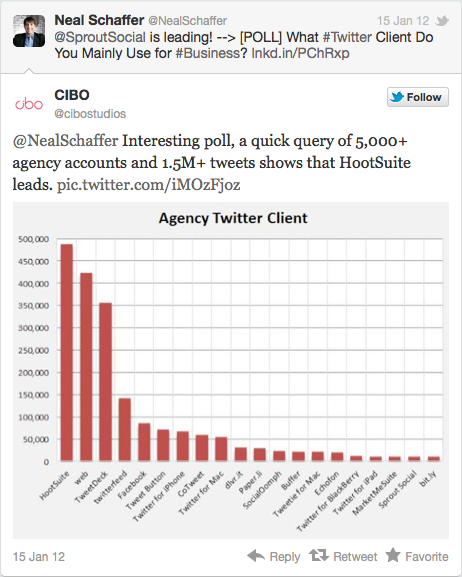 Check out an in-depth interview with HootSuite CEO, Ryan Holmes, and CIBO‘s ranking of the Top 20 Twitter Clients being Used in 2012. The interweb was buzzing as HootSuite announced the launch of three new apps (Digg, TrendSpottr, and InboxQ), the opening of our Engagement API, and the external integration of click.to. Users can now integrate Digg, InboxQ and Trendspottr into their dashboards starting Wednesday by installing them via the App Directory, which until today allowed users to share content only to Constant Contact, Flickr, Formulists, Get Satisfaction, Summify, Tumblr and YouTube. Featuring full integration with HootSuite’s social dashboard and a completely new look and user interface, the TrendSpottr app makes it easier than ever to discover and publish trending stories, viral videos and more to all of your social networks. Whether you are a brand manager or PR agency interested in monitoring real-time trends, a journalist or blogger in search of emerging stories, or a social media user that wants to be the first to spot viral trends, TrendSpottr will help you discover the most trending content from across the social web. We are very pleased to announce the new integration of Hootsuite into the click.to portfolio. Hootsuite offers its users the ability to manage multiple social media platforms at the same time. 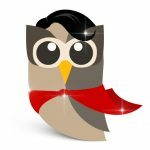 The Hootsuite Dashboard allows users to manage not only social, but also with the recent implementation of the App Directory, you can also add YouTube, Flickr, Tumblr to the list of Twitter, Facebook and Linkedin. With the Digg app for HootSuite, users can view current top news stories, search stories, Digg stories, discover and share content using the dashboard, whilst the TrendSpottr app lets users search for trending content by topic, keyword or phrase, as well as select from a list of popular searches. The addition of an InboxQ app to HootSuite’s arsenal lets users find questions on Twitter based on keyword and phrase searches, fine tune search results, and engage directly with those asking questions. Back in December, we reported that Summify, Constant Contact and Formulists had been added, in addition to YouTube, Tumblr, Get Satisfaction and Flickr that had been added when the App Directory launched back in November. A number of new apps will be added shortly, including Reddit, Blogger and Yammer. The HootSuite App Directory Feedback Channel provides users a place to share ideas for future apps. Integration with Blogger, adding Google Reader and supporting StatusNet are just a few of the suggestions already in the channel. Popular social networking management service HootSuite announced Wednesday it has added support for more social apps and opened its Engagement API. Digg, Trendspottr, and InboxQ have joined the HootSuite App Directory; a collection of apps and social media sites that you can manage with HootSuite. Each app has a unique set of features that you can access with HootSuite’s dashboard. The company also announced integration with click.to, an extension used to share information on social networks rapidly and efficiently. You can now share content directly to HootSuite from click.to, no copy and paste required. click.to, the desktop app from Axonic Informationssysteme GmbH in Karlsruhe, Germany, has announced its new partnership with HootSuite, the social media management system. The new “click.to HootSuite” app allows HootSuite users to immediately synchronize the implementation of social media campaigns on social networks like Facebook, Google+ and Twitter, from anywhere on the desktop. HootSuite is a cross-linker, an online service that allows social networks like Facebook, Twitter, LinkedIn, and WordPress to work on a single platform. click.to is an app that links all applications for the desktop and skips intermediary steps between several different actions–essentially, a cross-linker for the desktop. Read HootSuite’s initial announcement – The App Directory Grows with Digg, TrendSpottr and InboxQ – and profiles of the three new apps – A Closer Look at the Latest App Directory Additions. 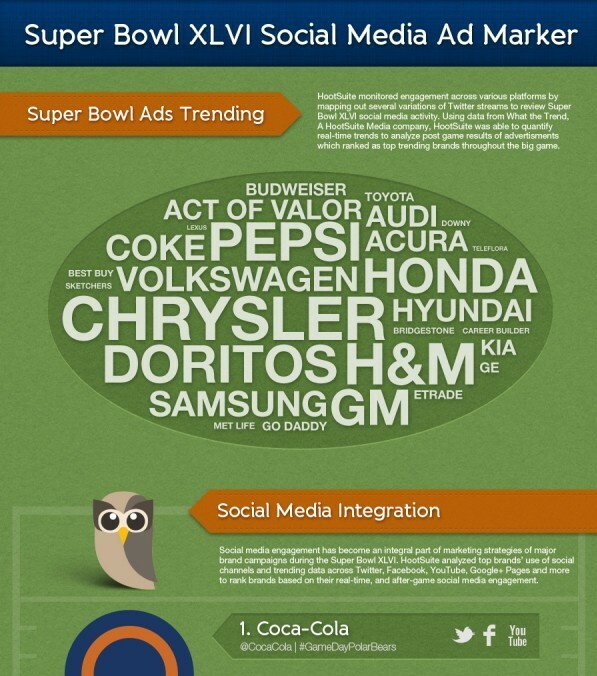 As mentioned in our HootSuite’s Super Bowl XLVI Social Media Recap, adotas and MediaPost analyzed our Super Bowl infographic and interviewed HootSuite VP Marketing, Ben Watson, on our methodology. We’ve included some snippets below but be sure to check out the full articles. HootSuite ranked Super Bowl advertisements by measuring their integration with social media sites including Facebook, Twitter, Google+, and YouTube, among others, as well as the volume of traffic and the nature of sentiment expressed about their brands on these social media platforms. The analysis combined a number of different inputs, ranging from Twitter Trending data, hashtags and Twitter handles, to YouTube views and Facebook search results. Altogether HootSuite drew on data from a half-dozen different platforms and mapped it against Twitter trending data to arrive at a final score. HootSuite chief marketing officer Ben Watson explained that the “heaviest weighting was given to scoring around the interactive engagement of the brand with fans on social media. For example, Coke topped this out by having the bears watching the game with you on Facebook, having their URL load the Facebook experience, and by providing a series of entertaining gestures throughout the game for fans that were engaged.” He added that the Coca-Cola commercials “also directly supported ‘building the relationship’ with your new polar bear friends and having them join you, instead of just clicking on a URL to find out about a product. The Solution Partner Program is a go! Designed for agencies, consultants, associations and value-added resellers, the Pro Solution Partner Program and the Enterprise Solution Partner Program allow Solution Partners to demonstrate social leadership and generate revenue streams by offering HootSuite Pro and Enterprise to their customers. Now HootSuite has launched a pair of solution provider partner programs, designed to help systems integrators and VARs help develop their customers’ social strategies across Twitter, Facebook, Google+ and more. The program comes in two tiers: the first, primarily affiliate-based in nature, enables smaller organizations to refer mostly SMB customers to HootSuite Pro. Meanwhile, the HootSuite Enterprise Solution Partner Program is probably where it’s going to be at for most TalkinCloud readers — it’s aimed at helping VARs, systems integrators, consultants and other players in the channel space capture larger customer deals. 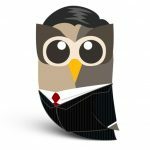 In both cases, partners get recurring revenue streams, since HootSuite is billed on a monthly basis. According to HootSuite, partners also get access to marketing materials, a partner portal featuring tons of information, best practices, partner badges for their websites and more of the usual one might expect from a full-blown channel program. HootSuite is hoping to attract VARs to sell both solutions but especially Enterprise to their midmarket and large clients, Switzer said. The company just surpassed the three million-user mark and wants to hit six million by the end of the year. 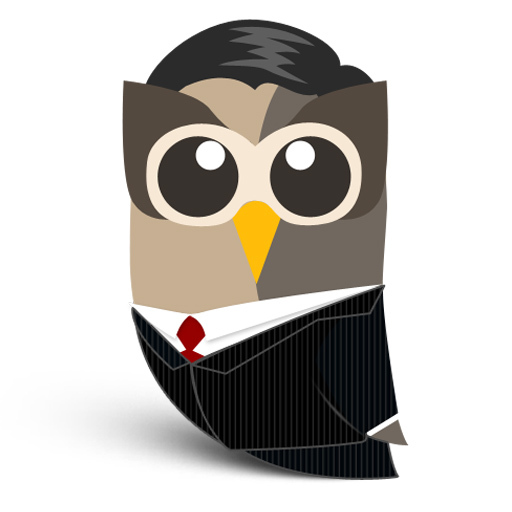 “It’s all about HootSuite working better with partners. This drove our new program which speaks specifically to VARs and their needs,” Switzer said. Social media marketing strategist and HootFriend, Laura Roeder, recently did an interview with Ryan Holmes. They discussed social media strategies, the explosive growth of HootSuite, and the owl’s expansion internationally. Social media agency executive, Neal Schaffer, recently tweeted about his poll on LinkedIn group Social Media Strategies for Business on what Twitter client they mainly use for business. After creative agency, CIBO, caught wind of the tweet, they replied with their own findings. Nice! We’re picking up speed now and you can expect more on the way. Stay up to date by following @HootSuite for the latest updates on the dash and @HootWatch for a steady stream of media coverage. If you have idea for us, you can vote up or suggest feature requests on our Feedback Channel. Want to learn how to make the most of the dashboard? Visit the HootSuite library for helpful white papers, info sheets, case studies, and more.